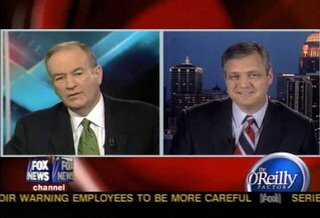 On last Friday (March 17, 2006), Dr. R. Albert Mohler of The Southern Baptist Theological Seminary appeared on The O’Reilly Factor with Bill O’Reilly on FOX News. Dr. Mohler was invited on The Factor in order to discuss recent comments by Pat Robertson and Franklin Graham in which they were critical of the religion of Islam (click on their names to view a video clip of and/or read their comments). Since I currently don’t have cable, I was unable to view the program when it aired live. Ever since last Friday I’ve been searching the FOX News site to see if they had posted a clip of Dr. Mohler’s appearance. They haven’t. But today I came across a site that contained both a transcript and a video clip of Dr. Mohler’s comments. You can access this material by clicking here. If you want to see how the world views the exclusive claims of Christianity, be sure and read the comments posted at the page linked above. It could be a real eye-opener. To defend Islam and fear guys like Dr. M is upside down. Postmodernity is insanity.